TVB dramas received miraculous television ratings 2 days ago due to Typhoon Vicente lashing through Hong Kong. Typhoon Vicente was raised to a level 10 cyclone signal for several hours, which made it one of the strongest typhoons to hit Hong Kong in the last decade. Residents rushed home for safety and turned on their television sets, pushing the ratings of Three Kingdoms RPG <回到三國>to skyrocket at 42 points! As the strong winds and heavy downpours blasted through Hong Kong, schools and offices were closed early. Millions of residents sought comfort in their favorite local celebrities, gluing to their television sets for a 5-hour TVB marathon! 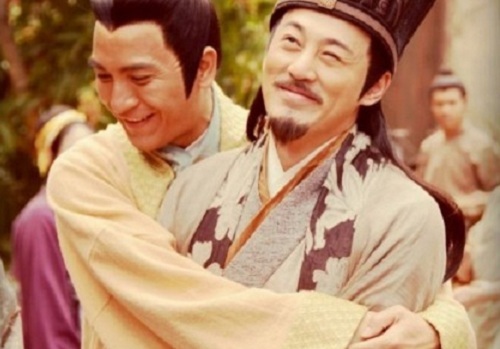 Three Kingdoms RPG, which aired in the 8:30 PM time slot, benefitted the most from Typhoon Vicente. Starring Kenneth Ma (馬國明), , Raymond Lam (林峯), and Tavia Yeung (楊怡), the drama’s ratings hit a record high of 42 points, with 2.69 million viewers tuning in, which marked it as the highest rating ever since its broadcast. It is coincidental that in Three Kingdoms RPG, Sima Shun (played by Kenneth Ma) was transported back to the periodic era due to a typhoon. It is also more interesting that Kenneth Ma’s English name in the drama, Vincent Sima, bears close resemblance to Typhoon Vicente as well! Witness Insecurity <護花危情>, starring Bosco Wong (黃宗澤) and Linda Chung (鍾嘉欣), averaged 37 points, attracting 2.37 million viewers. The drama is aired in the 9:30 PM time slot. The typhoon caused a power disruption and many areas in New Territories were unable to receive signals to watch TVB programming. Electricity was cut off at around 9 PM from the power generating stations at Castle Peak and Cloudy Hill areas. Power generation did not resume until 2 PM yesterday. Hence, Witness Insecurity’s ratings were negatively impacted. At the peak of the typhoon, TVB received many viewers’ complaints that they were not unable to receive the signal to watch Witness Insecurity. It was unfortunate that Witness Insecurity which was scheduled at 9.30 pm was hit by the power disruption. The former TVB ratings champion among currently aired dramas, Witness Insecurity lost out to Three Kingdoms RPG. TVB sitcom, Come Home Love <愛．回家> has been averaged sluggish ratings of only 20 points since its broadcast. However, Typhoon Vicente swirled up the ratings to 38 points, attracting 2.43 million viewers! The premier broadcast of star-studded TVB variety program, TV Funny <玩瑼三周1／2> averaged 32 points with 2.05 million viewers. The program mobilized 100 TVB artists, engaged in funny game segments reminiscent of Eric Tsang’s <曾志偉> classic game show, Super Trio <敵獎門>. TVB entertainment news program, The Scoop <東張西望> was also devoured by local audiences. Averaging 34 points, there were 2.18 million viewers who took the opportunity to catch up on the latest celebrity gossip. Do Txb invite a Taoist hermit to pray for rain everyday from now? WI already took over THC’s average rating, it can be predicted. THC’s average rating is only nearly 31 (rounded to 31) while WI has: 31, 31, 32 and in the last week, even being affected by the electricity, it gets 37 for eps 16. The whole week from 16 to 20 won’t be lower than 28 in order to make THC win. Then, THC is taken over the highest rated series status for sure. The new top is WI. For 3K, right now its has 30, 31 for two first weeks, 42 only for 1 eps but can make the whole week reach to 32 or 33 maybe. Then it can win WI or not, all up to 2 last weeks. It has 25 eps, one week more than WI, can be an advantage or disadvantage. Whatever, one LKH series will take the top place until now. Lolol! Looks like witness imsecruity wouldnt be able to take over thc as the top ratings le ..
Nope, 99% it’ll defeat THC. Looking at above analysis. Its a raining season, this week is an opportunity for TVB to get high ratings. Thank mother nature. TK is very lucky to get such high rating. I don’t think it is good..infact, I think it is quite boring but since my family are watching it, I am just watching along. WI is definitely better in term of plot although the ending may be quite disappointing!